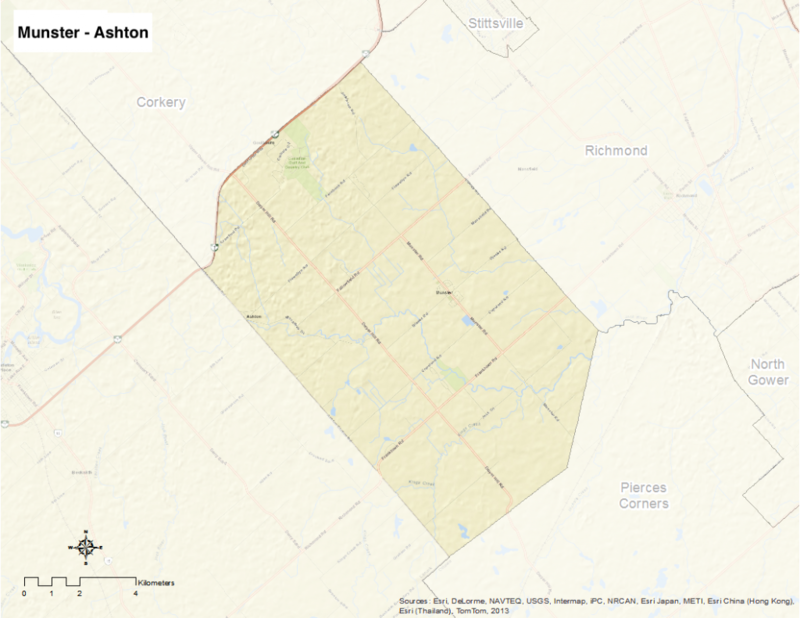 Munster – Ashton is bounded to the north by McArton, Spruce Ridge, Jinkinsin, Lucas, Flewellyn, Huntley, Fallowfield, Shea, Garvin, Eagleson, O’Keefe Court, Spring Cress and Cedarhill Roads. The Rideau River is to the south. To the east lies McCordick, Carsonby, 3rd Line, Barnsdale and Cedarview Roads. To the west lies Ashton Station, Beckwith, Boundary and Regional Road 6. Munster was originally part of Goulborn Township. Named for Munster, Ireland, the neighbourhood’s inception dates back to circa 1870s when its post office was established.